There are three church buildings in Cromarty, two of which are used for regular worship by the congregations of Cromarty Parish Church of Scotland and St Regulus' Scottish Episcopal Church. 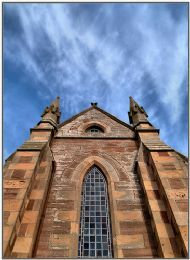 The East Church, dating from pre-Reformation times, was the old parish church in Cromarty. In 1998 ownership was transferred to the Scottish Redundant Churches Trust. The East Church featured in the BBC series 'Restoration Village' (2006). Funding from the Heritage Lottery Fund, Historic Scotland and The Highland Council made possible a major restoration project. Now that the restoration has been completed, the East Church is open to the public. With the approval of the Trust and the Kirk Session it is used for occasional services during the summer months and for special events. The West Church was built by the Free Church of Scotland congregation after the Disruption of 1843. Following the union of the Free Church with the Church of Scotland in 1929, both the East and West church buildings were used for worship. Since the 1990s the West Church has been designated as the parish church. Services are held on Sunday mornings at 11.45am. The Scottish Episcopal congregation in Cromarty meets in St Regulus' Church. Sunday worship is held at 9.45am. When there are five Sundays in a month, the three Black Isle Episcopal churches share a joint service at 11.00am (see Calendar for venue). Both St Regulus' and the West Church are used as venues for shared services, such as joint youth services, World Day of Prayer and Holy Week services. At 6.00pm on the first Sunday of the month there is a time of worship in the Victoria Hall. It takes the form of prayer, hymn-singing and readings from the Bible — with a crêche available and refreshments afterwards. Services are organised by Resolis Free Church of Scotland. The Mindfulness group meets on Tuesday evenings in the East hall betweeen 7.00 and 9.00pm and follows the teachings on Engaged Buddhism of Thich Nhat Hanh, a Vietnamese Buddhist now living in France. Usual program is 7.00pm tea then 1/2 hour discussion followed by practice at 7.45pm. Ring Maggie Dove on 10381 610212 for more details.